In paging through an old issue of Military Small Arms of the 20th Century, dated 1973, I came across a grainy black and white photo of what is described as the HK36. (It is at the bottom of this page) The caption reads in whole: "The 4.56mm HK36 rifle, an experimental military rifle which awaits a change in adoption policy." 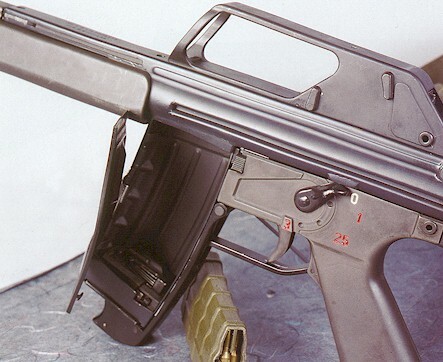 The other interesting project at H&K was a rifle known as HK36. Not to be confused with the G36, this project was part of the early stage of the international Advanced Combat Rifle (ACR) programme. Utilizing largely synthetic materials, the HK36 was a very lightweight and compact rifle; with an empty weight of 2.9 kg (6.4 lb.) and a length of 89 cm (35.0 in.). It was equipped with the proven roller-locked delayed blow-back system of the G3. The calibre was 4.5x36 mm, and the muzzle velocity of its 54-grain projectile was a modest 780 m/s. This translated into light recoil and excellent controllability, which allowed the cyclic rate of fire to be as high as 1,100 rounds per minute. To compensate for the moderate striking energy, the projectile contained an asymmetric tungsten carbide core, which provided a devastating effect in soft targets, as well as armour piercing capability. Another interesting feature in the HK36 was the inclusion of an optical collimator sight. 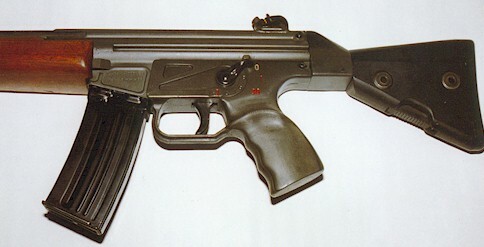 But in 1976, H&K decided to pursue another design as their ACR candidate, and for reasons of economy, the HK36 project was put on the shelf. This other design was the G11 rifle firing caseless ammunition. It has an SEF type trigger group that is numbered 0-1-25-3, (the black and white photo below shows 0-1-30-3) and a forearm that has what appears to be a G36 type cocking handle. The optical sight/carrying handle seems to mirror many earlier designs, including one made for the early G11. The buttstock assembly is retractable, and appears completely unseen before. 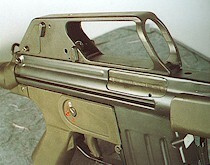 The unique magazine door of the HK36 that opened to allow disposable inserts, like the one directly underneath the rifle. This particular rifle is said to be one of the only surviving examples of the HK36 project. The rifle at top has a detachable conventional magazine, unlike this one. The design of this rifle clearly has paternity to the G36. Notice the similarity of the optical sighting system and the cocking handle to the modern G36. This rifle also has the early type three shot burst trigger group with, in order, 0-1-25-3 selector markings. Right side view clearly shows similarity to G36.